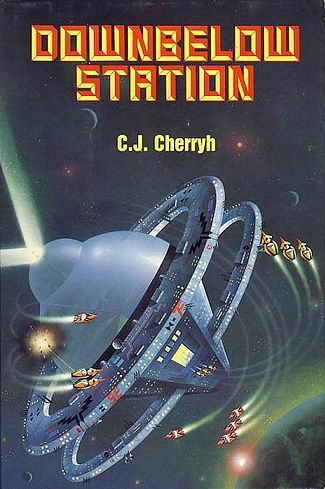 'Downbelow Station' by Carolyn J. Cherryh won the 1982 Hugo award for best novel. All else being equal, how can the BEST SCI-FI novel of the WHOLE year be so astoundingly dull? There's a space war, a space station, a tribe of cute fuzzy aliens, and it STILL manages to be the second worst Hugo (for my taste) of the decade. I read this on my real-life wonderful amazing trip to Disneyworld in Florida with my lady love and our friends. That trip remains my gold standard of heavenly temperatures, tranquil surroundings, and overall enjoyment. Best trip EVER, is all I'm trying to say. Meanwhile in hotel room, airport, and airplanes that horrible, boring book droned on in my head for what I believe was seven million pages. It's all bland inactivity far from the battle and third person immersion in the minds of some very unappealing characters unmatched until I read 'Cyteen'. You can pitch this book to me by pointing out that Pell Station in the 24th Century is a lot like Babylon 5, or that the planet Pell has the Hisa (who are very similar to the Ewoks I loved unequivocally in my youth). Doesn't make it true, I just mention it for comparison: lots of people LIKE this. C.J. is touted as a master of 'hard sf'. If true, I think the subgenre should be renamed 'Hard-to-take sf'. I prefer human characters with open minds, kind hearts, and a sense of humor, I guess, at least if I have to invest weeks in the reading. Bujold is superior, and either Kirk or Picard is preferable.